When you have combination or oily skin, it can sometimes be a challenge to find makeup that can keep your skin looking matte and good all day. Here are some of my picks for my favorite products, and while you’re here don’t forget to check out my first post with skincare here. I promised this post ages ago and you might’ve forgotten about it but I finally have it up! Enjoy! If you are looking for something full-coverage that’s going to last all day, this foundation is a go-to. It’s matte finish doesn’t quit, and though it’s a little bit on the thicker side you only need a few pumps, although like with anything if you go overboard it will get caky. If you have really oily skin you might really enjoy this especially. I would say to go one shade lighter than you think you need with this one though because it oxidizes (gets darker throughout the day after you apply it). I’ve used this one up almost completely so you know it’s good. Do you want a comfortable satin-matte finish foundation that goes on easily, lasts all day, and is $6.99? You might want to consider this foundation especially when looking for a new foundation and especially if you’re on a budget. This is a great drugstore foundation I’d recommend. Sometimes it can be hard to find a powder that keeps you matte without looking caky or so “powdery”. This powder from Maybelline doesn’t get caky. It’s really smooth and almost silky, but it does keep your makeup in place and I’ve hit pan on two of these. It’s really lightweight and your skin does look pretty “poreless” – you can even use it under your eyes in a pinch due to it’s texture. With this product where when they say matte, they mean matte. 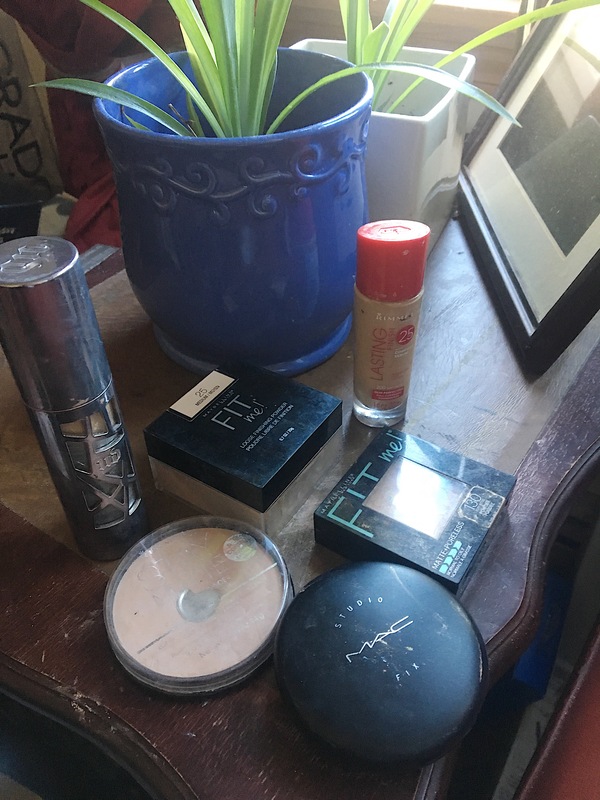 It’s been in my collection for years as it used to be somewhat of a cult product and one that I used to throw in my bag for touch-ups all the time and I’ve used up several of these. It’s a good, quick, affordable pigmented powder that will keep you matte. It can be nice to have a powder option sometimes that gives you coverage (especially when a lot of translucent powders these days can give you a white cast), and this powder is a great option. I notice if I packed a little more on areas that makeup tends to disappear off of first, my makeup will still stay in place and last all day. The powder is finely milled and I usually go an entire day without touching up. This is classic in the makeup community because it’s completely full-coverage and lasts all day. If you want something to keep your face fully-locked in and matte, this is pretty good at doing that. You can also use it as a powder foundation, so if you’re looking for one of those, I’d say to look at this one too. Do you use the MAC studio fix plus as a setting powder or as a foundation? Or both? I’m always on the hunt for makeup that is good and STAYS on oily skin. I used it as a setting powder or mostly a touch-up powder during the day, but I’ve used it as a powder foundation before and it works great for that! !